Don't wait! Our Novice/Interm Moab MTB Skills Camp has Two Spots Left!! The end of April is fast approaching and we’re getting super excited about our upcoming novice/intermediate Moab MTB Skills Camp! We have two more spots available and can take sign-ups as late as April 24th. It’s an amazing camp and for anyone that loves to ride a mountain bike but doesn’t feel comfortable on technical trails, or has crashed one too many times and has no confidence, or just wants to spend five days in the mountain biking mecca of Moab, this camp shouldn’t be missed! For more information go to our website, www.alisondunlap.com. You can also call Rim Tours (800-626-7335) for registration information. We’d love to have you join us in Moab!! If you love your dog you HAVE to read this!! This past weekend my husband and I had the amazing experience of working with Dog Listener Penny Locke. We have a 9yr old Border Collie named Jiggs. Everything you read about Border Collies is true. They are energetic, high maintenance, emotional, moody, and extremely sensitive. Jiggs is a wonderful dog. Our problems are only at night. As soon as we turn the light out in the bedroom Jiggs is up and pacing. We have hardwood floors so we can hear his nails clicking on the floor as he wanders around for literally hours. Some nights are better than others, but it mostly drives us crazy. He sleeps all day without moving a muscle. Yet when we go to bed everything changes. Jan Fennell, the original Dog Listener, came up with a revolutionary way to work with dogs after spending time with Monty Roberts, one of the most famous horse whisperers in the world. Her training method is based on mutual respect between the dog and the owner. No harsh words are used, no choke collars, no commands, and no rules or restrictions. It is all about forming a working, dynamic relationship with your dog. Instead of doing things out of fear, the dog does things because he wants to; because he trusts you, and because you’re a leader he respects. We spent this past weekend with Dog Listener Penny Locke. We were still having trouble with Jiggs pacing at night and it was creating so much stress in our little family that it was hard to be around my husband. He was so worked up about the dog that it spilled over into everything he/we did. So Penny came to the rescue. She went through the fundamentals of the training and had us practice everything. We went for walks, played Frisbee, cooked meals together, watched lots of training DVD’s, and had a lot of laughs about crazy dog behavior. I won’t go into detail on what the training involves because that would take hours to write, but if you’re at all interested, check out Penny’s website http://www.allabout-canines.com/ or you can visit the original Dog Listener and learn what this training method is all about. http://www.janfennellthedoglistener.com/. The Dog Listener training method has literally changed our lives. Jiggs sleeps all night long, he isn’t stressed, and he loves being just what he is….a dog. My husband is happier and that means our marriage is happier. Haha! I highly encourage you to check out this wonderful method of working with your dog. Peaking for your big event takes careful planning, skill, and a little luck! Being able to peak for the “big race” is one of the hardest things to do in cycling. Even after 20 years of racing I still had races that didn’t go well after doing everything perfectly to get ready. There are things you can do, however, to improve your chances of having that “perfect” day at the most important race of the season. Peaking for a race begins months earlier in the off-season. This is the time when athletes sit down and plan out their entire race season. Most cyclists know that they can’t physically race at their best from March through September, so most will prioritize their races by order of importance. Once a rider has established which races are the most important, she can then build her schedule around those particular events. Designing a training schedule that brings you to your most important race in peak form takes years of experience and a little luck. Based on what kind of race you are peaking for, you’ll want to design your training so that the month before you’re doing the most race specific training possible; workouts that are most similar to the kind of race you’re doing. For example, if you are peaking for the Cyclocross National Championships in December, it doesn’t make sense to do 4hr endurance rides the month before your race. You instead need to be doing lots of short intense anaerobic power workouts. It is also important to reach your peak event in not only super fantastic race shape, but rested and mentally motivated. You can use something called a “taper” in the weeks leading up to your big event. A taper is a way to maintain intensity and peak race fitness, while allowing your body to rest and recover at the same time. A taper typically lasts 1-2 weeks, depending on the athlete. In a taper the intensity stays high, but the volume goes way down. You can still do high intensity workouts leading up to your big race, but don’t add any extra mileage during your taper. You are basically doing short interval workouts and nothing else other than recovery rides. And skip the big weekend group rides as well during your taper. The last two days before your event are the most important and can also be the most challenging. In these two days you need to make sure you are 100% rested, but also 100% opened up and ready to race. If you’ve had a few easy days leading up to your event, it is super important to get the legs “opened up” before your race. Pre-race openers can be done 1-2 days before your event and involve maybe some tempo riding and then some short, high intensity efforts. If you are doing a mountain bike or cyclocross race, your pre-race openers can be done on the course. On race day it is super important to get a good solid warm-up before your event. I recommend doing a combination of endurance and tempo and then finish with some short high intensity efforts as close to the start as possible. In general, the longer your event, the shorter and less intense your warm-up needs to be. For example, if you are warming up for a 24hr solo race, it doesn’t make sense to do a bunch of vo2 intervals. We all know there is a lot more that goes into having a good race than just fitness. There can be crashes, weather, and mechanicals that unfortunately affect the outcome. Coming into your most important race in peak fitness will give you the confidence to handle not only the physical stress of the race, but any unexpected bad luck that might derail your effort. When you cross the finish line you want to know that you did absolutely everything possible to have your best day. Don’t have any doubts or “what ifs”. The athlete that wins the big one is the athlete that is the most prepared. My high altitude aerobic marathon hut trip! Every winter my husband and I participate in a number of hut trips in the mountains of Colorado. “Huts” are elaborate log cabins, built and maintained by the 10th Mountain Hut Association of Colorado. The huts sleep anywhere from 6-16 people. The only thing we had to bring was clothing, sleeping bags, and food. The kitchens are fully stocked with cookware, propane burners for cooking, and two wood burning stoves. One is situated in the common area and has a large metal pot for melting snow. The other is situated in the kitchen and is actually an old fashioned stove/oven. In most of the huts the upstairs is the sleeping area. There are platforms with mattresses and even pillows. It is quite the set up. This past weekend we joined seven other cycling friends of ours and ventured to Margy’s Hut outside of Aspen, CO. Heather Irmiger, Jeremy Horgan Kobelski, Kelli Emmett, Frank Maple, Whit Johnson, Pete Webber, Marc Gullickson, my husband Greg, and myself left the parking lot around 10am on Wednesday morning. With so much lung power, we reached the hut, 6.5 miles and 3 1/2hrs later. Ouch! And that was after gaining 2600 ft, ending at 11,400ft. Double ouch. After a quick lunch, we loaded up our day packs with shovel, probe, avalanche beacon, more food and water, and the first aid kit, and headed out for a few quick runs before dark. Nothing like maximizing the amount of calories burned in a day. Backcountry skiing is a unique blend of EXTREME physical exertion going uphill, and then unbelievable pristine powder with incredible views on the way down. This winter the snowpack in the central Colorado Mountains has been thin and unpredictable, thanks to El Nino. While we had plenty of fresh powder, there was no substantive base underneath. That meant that at any time you could be skiing along and then the snow underneath would collapse, dropping you into deep sugar snow. On the mellow slopes that wasn’t too much of a problem. On the steeper slopes, “punching through” often resulted in going over the handlebars, a cycling term used when one flies over the front of the bike, often landing face first on the ground. Crashes on skis of this manner are usually spectacular, but landing in so much soft powder keeps the injuries to a minimum. Mostly it is a bruised ego. We skied until dark, literally, and returned to the hut starving and exhausted. And this was only day one. One of the best parts about a hut trip is all the yummy food you get to eat. We probably burned upwards of 4000 calories today, so that meant a BIG dinner. We usually do group dinners; everyone helps cook and we all eat together. And of course there is the alcohol and the amazing combinations people come up with using snow and ice. Thursday was a marathon day of skinning and skiing, non-stop for almost eight hours. We didn’t even take a break for lunch; everyone ate quick snacks on the uphill hikes. No one wants to slow the group down. And everyone wants to be the first one down the next slope of untracked powder. The great part about Margy’s Hut, is the skiing is very safe. 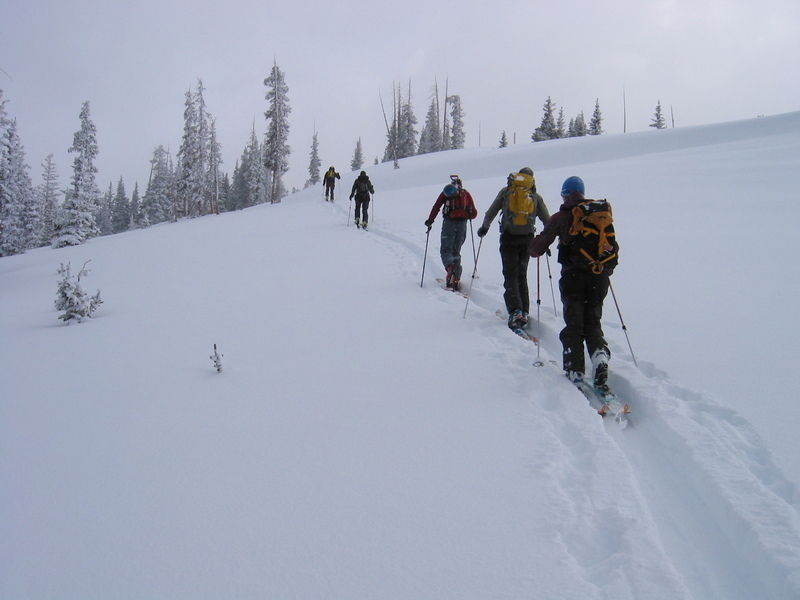 With the typical unstable Colorado snow pack, we skied slopes between 22-30 degrees with low avalanche danger. No one wants to push the envelope when the consequences are so severe. Jeremy Horgan Kobelski is a backcountry animal. He broke trail for us most of the day, and was the last one to head back to the hut in the late afternoon. Eventually the sun set and it was time to head back. I had nothing left in the tank. Another 4000 calorie day. Time to eat! Everyone was pretty spent and it took a while before we could muster up enough energy to cook dinner. And bed came early for most of us. What a huge day. Our last day was much the same; a few hours of crazy hard skiing in the morning, a quick lunch, and then the ski out with our fully loaded packs, back to the cars. And then the long four hour drive back to Colorado Springs. I don’t think we’ve ever done a hut trip where we sit around, drink hot spiced wine, and enjoy the comforts of the hut while reading a book. It is always a marathon, aerobic, never ending, lung busting, calorie burning adventure. I wouldn’t have it any other way! And next month we do it all again at the Eiseman Hut outside of Vail, CO. Stay tuned for the next oxygen deprived ski trip. Check out my new coaching column at MTBRacenews.com! I just started a monthly coaching column in MTBRacenews.com. This most recent entry is about the transition from the end of the cyclocross season to the beginning of the road or mountain bike season. It was posted a few days ago so you’ll have to scroll down. Enjoy! www.MTBRacenews.com. 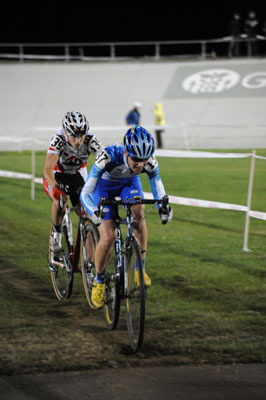 I'm selling my 2003 Nat'l Champ Cross Bike and Santa Cruz Heckler on Ebay! I’ve got two bikes for sale on Ebay; a Santa Cruz Heckler free-ride bike and the Black Sheep/Santa Cruz cyclocross bike I won the 2003 National Championships on in Portland, OR. Both bikes are in great shape. The cross bike was only raced one season. It was built by James Bleakley of Black Sheep out of Ft. Collins. I had it painted to look like a Santa Cruz. Unfortunately the paint job on the bike wasn’t a very high quality so there are lots of chip marks. The frame is custom titanium with Shimano parts. I bought the Heckler in Feb of 2004. It was my “downhill” training bike used in Moab, UT to improve my skills for the upcoming season and Olympic Trials. I absolutely love the bike and the only reason I haven’t ridden it is because LUNA is sponsored by Orbea. It also has the Maxxis 2.4 ADvantage tires that I personally designed myself. If you look at the side tread you can actually see the letters A and D. They are a great tire for Moab. Even though this is a free-ride bike, it is set up as more of a cross country bike. It has lots of travel and suspension, but not the huge weight of more traditional free-ride bikes. Check out the two links. I am also including a signed Team LUNA jersey for the lucky winners of these two bikes. Good luck and have fun. And spread the word to anyone else that might be interested! 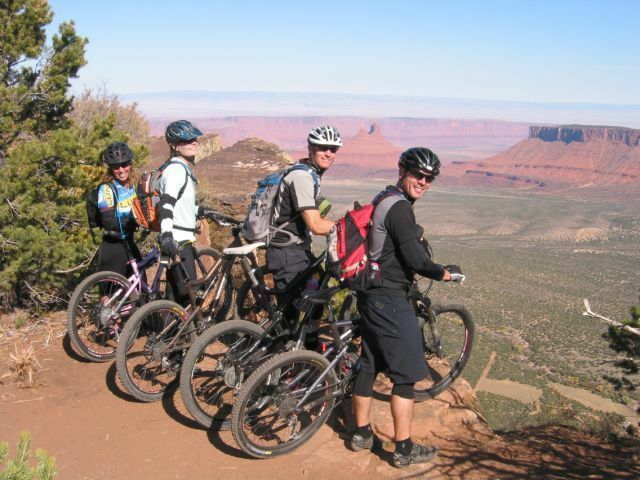 Alison Dunlap Announces New 2010 Moab Mountain Bike Camps!! Come join Alison Dunlap, World Champion and 2-time Olympian, for an exciting five-day mountain bike adventure in Moab, UT! Whether you’re looking to improve your technical skills and confidence, or just want to experience the incredible beauty of the desert on big epic rides, these camps are for you! In our Moab five-day camps you’ll be treated to four days of skill work (Level I), amazing rides, gourmet food, luxurious condos, relaxing massages, educational seminars, and coaching. With our combined experience of racing, riding, and coaching we’ll give you an adventure you’ll never forget! 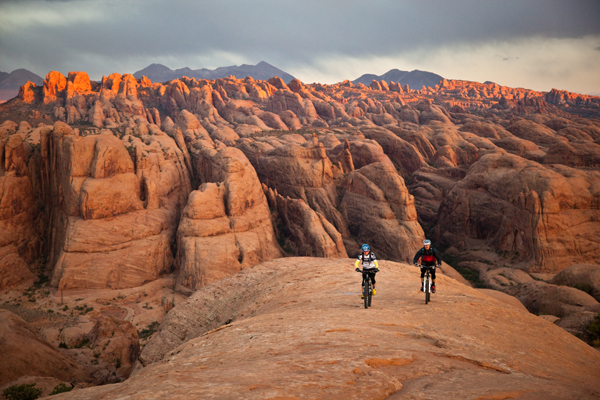 Come to Moab and join us for an exciting five-day mountain bike adventure! If you’ve always wanted to ride in Moab, but lack the skills and confidence to safely enjoy the trails, then this adventure is for you. In our Moab five-day camp you’ll be treated to four days of skill work, amazing rides, gourmet food, luxurious condos, relaxing massages, educational seminars, and coaching. The number one goal of the Alison Dunlap Adventure Camps is to share with you the skills and techniques that will make you a more confident rider. We run all our camps in a safe, supportive environment, while stretching your “comfort zone” both mentally and physically. With our combined experience of racing, riding, and coaching we’ll give you an adventure you’ll never forget! This five-day Moab camp is for the novice rider that wants to learn the basic skills of mountain biking on trails and singletrack. If you’ve been riding for years, but lack the confidence to step it up in ability, or maybe you’ve just started mountain biking and want to learn the core concepts and techniques of the sport, then this camp is for you. For those of you that want the opportunity to ride with Alison Dunlap, World Champion and 2 time Olympian, and already have a strong mountain bike background, come join us in Moab for a five day ride camp. In our Moab Ride Camp we’ll spend a small amount of time reviewing the advanced riding techniques needed for Moab, and a large amount of time riding the epic trails in the area. We’re not going to spend a lot of time teaching you how to ride your mountain bike. This camp is for riders that are comfortable on technically challenging advanced singletrack, but haven’t ridden in Moab; or maybe you’ve already been to our Moab Skills Camp and want to come back for the more advanced rides. We’ll take you out for long epic rides on some of Moab’s newest singletrack as well as the big classic rides in the area. While our emphasis in the Ride Camp is all about riding trails without a lot of stopping, getting into a rhythm and letting things flow, we can always stop to session things that present fun challenges and test the skills. Who is Alison Dunlap ?? Alison is a superstar in the sport of cycling. She competed in two Olympic Games, won the Mountain Bike World Championships, the World Cup Overall, and the National Championships thirteen times. 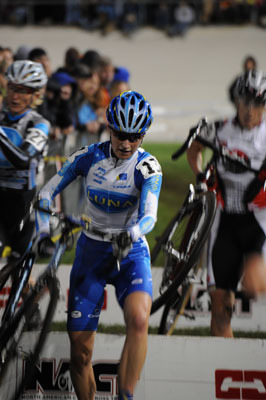 She has also been coaching for five years and is a USA Cycling Level II certified coach. Alison and her husband Greg, a former Pro mountain bike/cyclocross racer and USAC Level III certified coach, have been running the Alison Dunlap Adventure Camps in Moab since 2003. The 2010 season begins their eighth year of teaching and instructing mountain biking.